Yes, that David Duchovny from X-files and Californication. This was a fun book and a quick read. 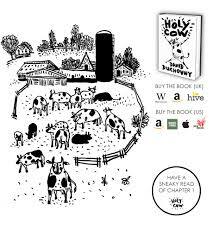 Elsie Bovary is a heifer on a dairy farm who learns the horrible truth about humans’ relationship to farm animals. She doesn’t take it lightly and devises a plan with the help of Tom Turkey and Shalom the pig to escape to India where she will be safe from the food chain. Before they reach India they pass through Turkey and Israel learning many lessons along the way. It would be a good read for teens, especially vegetarians. This entry was posted on March 6, 2015 at 5:54 pm and is filed under Adult Readers Advisory, Fiction, Teen Readers Advisory. You can follow any responses to this entry through the RSS 2.0 feed. You can leave a response, or trackback from your own site.